Takota has a home! 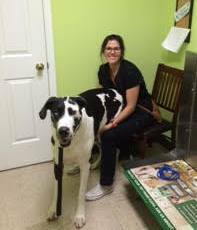 - Rocky Mountain Great Dane Rescue, Inc.
Takoda has a home with her new adoptive family in Whites Creek, TN. Jordan and her husband Tad have been coping with the sudden loss of their 6 year old Dane earlier this year. Not too long after her passing Jordan started searching for another Dane. Takoda came into rescue and fortunately was not too far from where she lives….This is when Jordan and Tad opened their home and hearts to fostering this lovely lady. The moment Takoda came into their home they knew she was their perfect match. The family involves their Danes in everything they do outside of the home. We couldn’t be happier with the placement of this sweet girl. Way to go Takoda!